Gathering Inspiration can be a real treat as this week can testify. Spending a day in London with all the colours, shapes and sounds brings a huge amount of ideas. 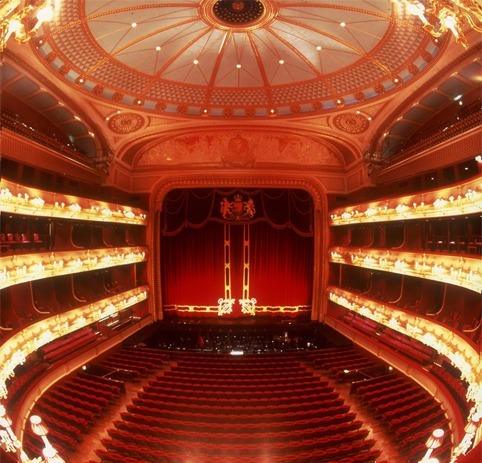 But the most inspiring came not from Kensington Palace as expected but from The Royal Opera House. An evening in this place lifts the spirits no end. What did I see? The Nutcracker. Looking at the fabrics, costumes and general bling for this lovely ballet makes me realise how hard the teams work to put on this entertainment. And that is not including the hours of practice the dancers put in. Well worth a visit. But what about Kensington Palace? We looked at the fabulous rooms of course and the staircases. 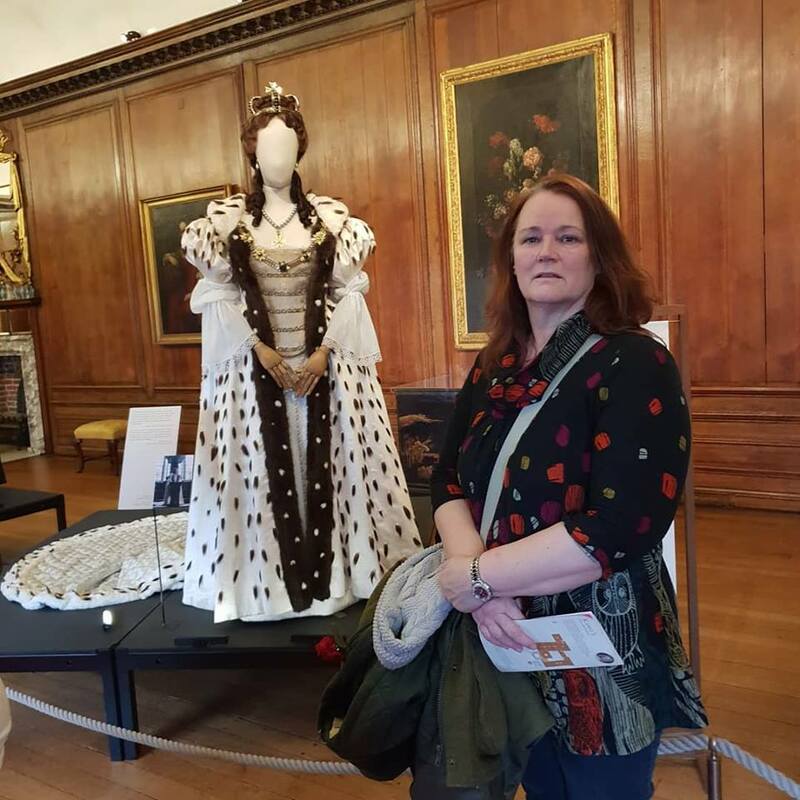 We loved the Princess Diana clothes, and the clothes from the film The Favourite which of course is about Queen Anne. 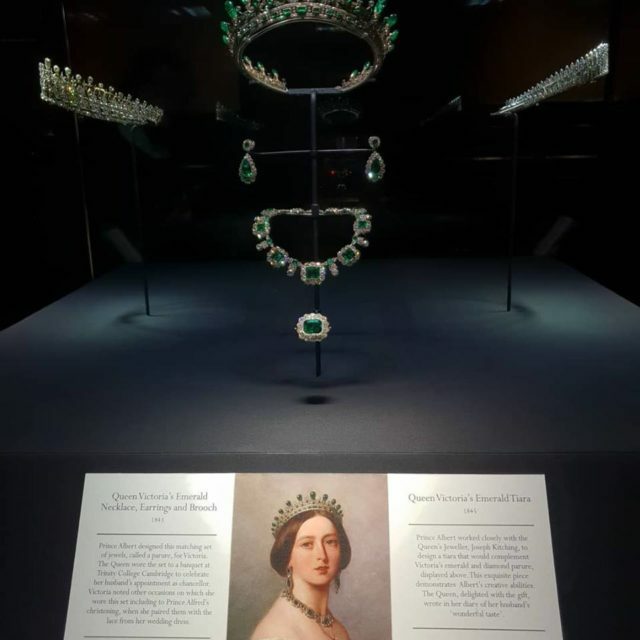 Unfortunately the rooms for Queen Victoria were closed but we did get to look at the fabulous Tiaras she wore. I was rather taken by this suite even though my theme at the moment is red and not green. Why a red theme you ask? I am currently working on a number of items for the King’s Lynn Embroiderers Guild Exhibition in July. We will be at St Nicholas Chapel so come and take a look at what we get up to. the Exhibition theme is the rainbow so it will be colourful. We have room for stall holders if you are interested, your stall must be textiles of some sort. Fabric based, weaving, threads, found materials, anything that can be used for textiles so that includes decoration and paints too. Just to remind you that you can rent Eau Brink Studio for anything from one hour to the entire day for your projects large or small. You get to use all the facilities, cake is supplied, heating or air conditioning depending on the weather. There is a large working area. Large enough to lay out an entire quilt if needed. Just give Anita a call on 01553 762115 or email on [email protected] for further details. Wednesday 23rd of January is the next Experimental Wednesday. If you want to join us just go to https://www.eaubrinkstudio.co.uk/event/experimental-wednesday-2-2/ and book in. You can be at the beginning of your artistic journey to join in or just looking to perfect your skills. We stat at 10 am and finish at 4 pm. You will be welcomed with tea and home made lemon cake. So why not pop in and try something new? A New Year- New Shop for Eau Brink Studio. Where is it I hear you ask? 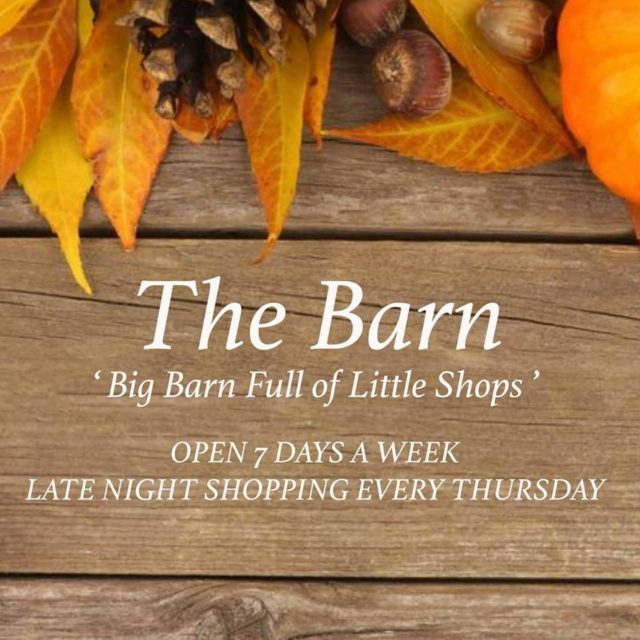 The Barn, 59 Wisbech Road, Long Sutton, Norfolk, United Kingdom PE129AQ. Open 7 days a week. You will find loads of fabulous items for gifts and home in The Barn. As you enter the coffee shop you will find us on your left. 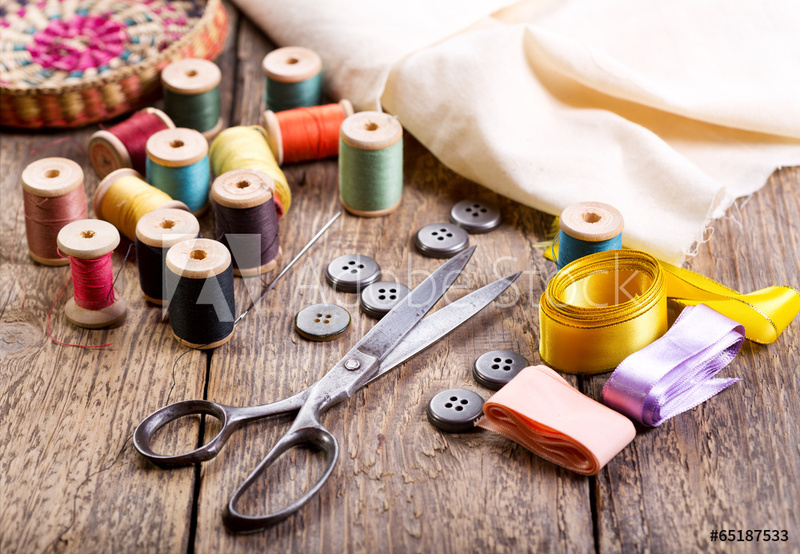 The shop will stock items you are used to seeing from us such as our peg bags and scissor holders with scissors. But also new items such as scissor keepsakes, new bags, Dyes both natural and man made (instructions are included with the dyes), Scolabrush kits and Xpandaprint too. Carded Fleece from our own Lincoln Longwood sheep. Some dyed and some natural. Dyed and decorated feathers from our ducks during their moulting season. I will be also hosting and teaching pop ins for those of you who what to give something a try but do not feel ready to commit to a full workshop yet. What will be included? 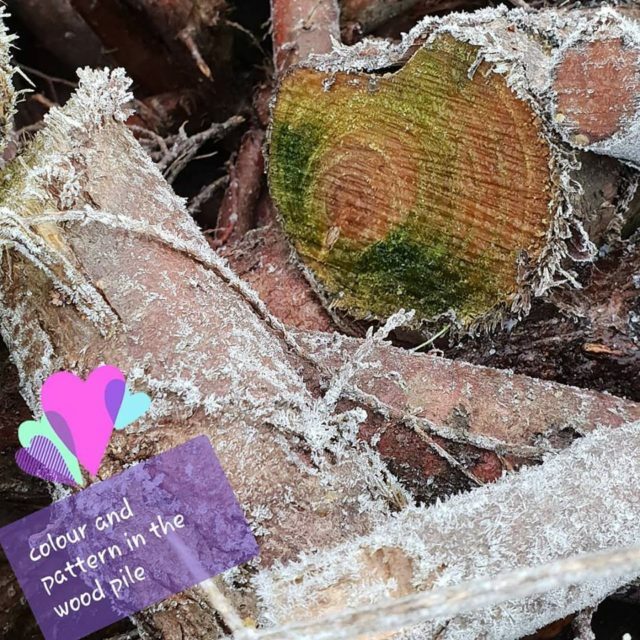 Powertex for just £5.00 you can make a brooch, then as you feel more confident move up to a jar for £7.00 or a bottle to put your candles in for those long summer days in the garden. Suitable for all ages. Not interested in Powertex? 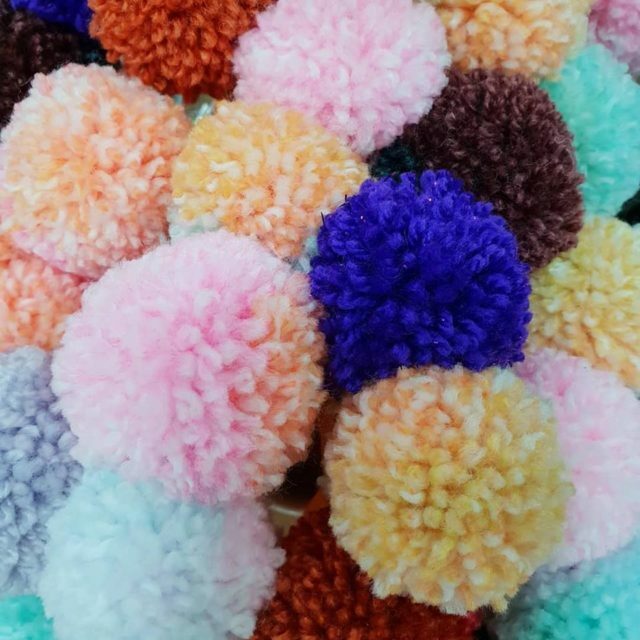 The how about PomPom making for £5.00 you can make a range of PomPoms using different colours and sizes. Suitable for all ages. Or sewing may be your thing. I will be demonstrating skills including patchwork, quilting, free motion embroidery. Hand stitch too. Come on in and ask me questions and if I can I will help you with your projects. For all ages. And of course I will be bringing in some mixed media such as Xpandaprint and Scolabrush which are two of my favourite products to use. The Website www.eaubrinkstudio.co.uk is up to date with the years workshops and fairs. New workshops are Pauline Wrighton – Finding Your Feet. 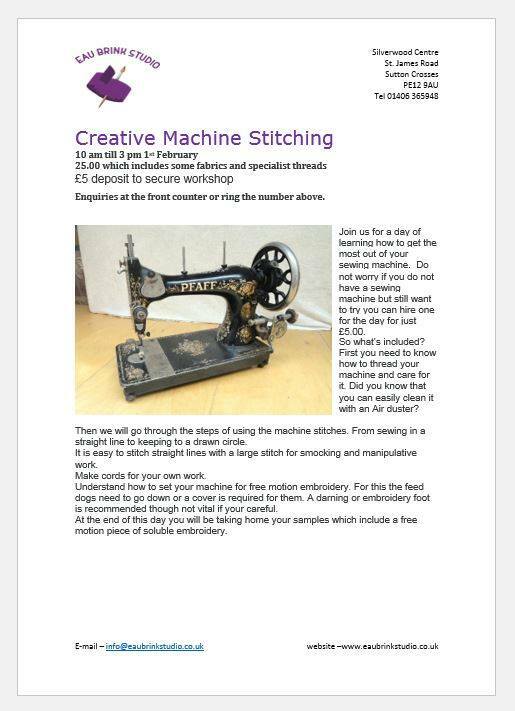 This workshop teaches you all about the feet on your sewing machine and what you can do with them. On the weekend of 18th May. MellyMade Designs – Lampshade up-cycling using her fabulous technique with transfer paints, on the weekend of the 27th and 28th July. I am also introducing the use of the studio of those of you who need space to complete a project or just cut your fabric on large tables saving crawling on the floor. You get full use of the studio including the refreshments for just £4.00 per hour.